Today is Johnny Cash's birthday. In the last few posts we've been tracing the "Man in Black" theme of solidarity through the music of Johnny Cash. Having articulated the "Man in Black" theme we explored it in a three different social locations, from the suffering of Native Americans to the hopelessness of prison to the darkness of addiction. One more post before leaving this theme. In the Old Testament the anawim are the poor, afflicted and oppressed people of the land. The anawim are the vulnerable ones who God cares for and will bless. The Spirit of the Sovereign LORD is on me, because the LORD has anointed me to preach good news to the anawim. He has sent me to bind up the brokenhearted, to proclaim freedom for the captives and release from darkness for the prisoners. These are the same texts--expressing God's care for the anawim--that Jesus invokes in the Sermon the Mount and his Nazareth Manifesto. The anawim were very much on the heart of Jesus. 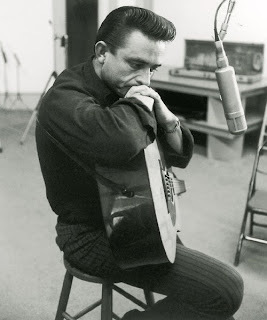 And like Jesus, if Johnny Cash was anything he was a troubadour for the anawim. When you think of Johnny Cash songs you think about the anawim, songs about the downtrodden and beaten down. I think the song that illustrates this best is a song that Cash wrote early in his career, a song he recorded with Sun Records. It is, perhaps then, the primordial Johnny Cash song if we think of "a Johnny Cash song" as being a song about the anawim. You can tell it was a song that was important to Cash. He returned to it again and again. The song shows up on the At Folsom Prison album and on the last album Cash recorded with Rick Rubin before his death, American IV (the same album that has "Hurt" and "When the Man Comes Around"). Recall, in Cash's early career at Sun he was working alongside other Sun artists like Elvis and Jerry Lee Lewis establishing the early sound of Rock and Roll. Consequently, Cash's early work with Sun tended to focus on the sock hop crowd, singing songs about teenage love and heartbreak. The tunes were fast-paced and catchy. The lyrics lighthearted. And to be honest, I really like the Sun recordings of Johnny Cash. For fun and listenability I go for the Sun recordings when popping in some Johnny Cash. At Sun teenage pop songs were the sorts of songs that Sam Phillips wanted from Cash. So Cash was increasingly pulled in that artistic direction. Pop music that would get played on the radio or punched in at the jukebox. But that isn't the sort of music we think of when we think of Johnny Cash "the Man in Black." So when did that guy show up? To be sure, we caught a glimpse of him in one of Cash's first hits with Sun, "Folsom Prison Blues." But it had been awhile since Cash had recorded a song like that. Even so, "Folsom Prison Blues" was an up-tempo song. So today, on Johnny Cash's birthday, we ask when was "the Man in Black" officially born? When did Johnny Cash start singing the songs of the anawim? On the long car rides [to and from concerts], Cash thought hard about his writing, trying to figure out what was different between some of his best early songs and the ones he'd been writing recently. He realized he had drifted away from writing from his personal experience. Wanting to get back to that approach, Cash recalled the time a stranger came up to him backstage during his first trip to California. The man had just been released from prison and was looking forward to going home to Shreveport to see his wife. But he didn't know how or when he could get there because he was broke and jobless. He knew that Cash was a regular on the Louisiana Hayride and asked him to say hello to his wife if he got to Shreveport first. [The song] wasn't just a [teenage] weeper for [Sam] Phillips or a generic song for the jukebox. This was a song Cash felt deeply...He like the idea of casting a prisoner in a tender light because it meshed with is Baptist values of forgiveness. He liked the song so much, he used his older daughter's nickname in it. I think with this song, recorded in 1957, "the Man in Black" was born. Artistically, Cash had figured out--in the midst of all those jukebox and pop songs--who he was going to be and who he was going to sing for. He was going to sing for the man dying alone by the railroad tracks. And for all the rest. Johnny Cash was going to sing for the anawim. It seems to me that Johnny Cash was a man who followed a calling. From an early age, he knew that he would be a music singer. Once there, that calling became more specific - he had to sing a particular song/way. Johnny's calling was more connected to his early Baptist roots than to any desire or need for success/celebrity/fame/fortune. How he worked this out in his life is fascinating, perhaps because we all can identify with a calling of our own. "Troubadour for the anawim" very much nails it. I wonder if anyone else has captured Cash with these words? YouTube of Cash singing this song on the Tex Ritter Ranch Party Show back in 1957. He had such a strong voice! Not sure. Googling "troubadour for the anawim" with quotes just shows this post. I have really enjoyed this series. Thanks so much for it. My Grandpa, who died when I was around 13, had a lot of Cash albums and I learned to love Cash back in the 70's listening to those albums. Somewhere along the way I lost my album collection, including those Cash albums, but that's a story for another time. I learned later on that my Grandpa was a lot like Cash. That he had many of the same battles waging within him. Interestingly my life was to follow a very similar trajectory and as I learned more about my Grandpa, and about Johnny Cash, it was comforting to know that I wasn't the first, or the last, to find it impossible to leave the world of the "anawim" (as you say). If I was to walk that hard road, I was at least walking in some pretty great footsteps. There's a song by Kris Kristofferson called The Pilgrim, Chapter 33, that was inspired in part by Johnny Cash. I remember hearing that song back then when I was a kid and being mesmerized. In the innocence of childhood I didn't really understand it. Little did I know at the time that, like my Grandpa before me, this was to be, in so many ways, the story of my life. I'm certainly not proud of it, and "If I could start again, a million miles away..." I would try to do things differently.